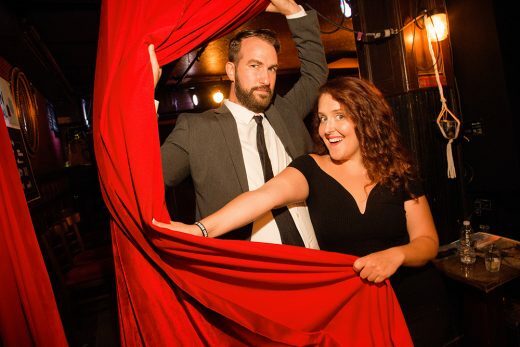 If you’ve ever dreamed of turning your latest Tinder date into an original musical, I don’t know what kind of a person that makes you, but you can take a stab at making this odd dream a reality at the return of Rebecca Vigil and Evan Kaufman’s Your Love, Our Musical, now presented at new brainy venue Caveat. It’s fairly self-explanatory; the duo selects an actual couple from the audience and interviews them. After that, they work their magic and craft a whole (and wholly improvised) musical about what they’ve just heard. If you’re looking for a new perspective on your relationship but can’t afford therapy, this could be the way to do it. What happens if you combine “gym training,” “techno party,” and “corporate mindfulness church?” No, not the latest innovation in live-work-play space or a new coworking franchise, at least not yet. Rather, it’s a new performance piece by Polish choreographer/performer Marta Ziólek, who has assumed the moniker Angel Dust for this experience. Dubbed the far-reaching term of “utopian,” the show examines bodies, what they can do, and what they can be seen as. Can a body become a sculpture of a machine successfully, or will it always still be a body? The show is presented as part of the Perforations Festival, a multi-day event showcasing performance work of all types from artists based in the Balkans. After Thanksgiving, the giving of thanks doesn’t have to end. On the good old day of rest, even though you’ve probably been resting for a while after eating all that food, you can get an even bigger dose of thanks in the form of this new music and drag showcase. 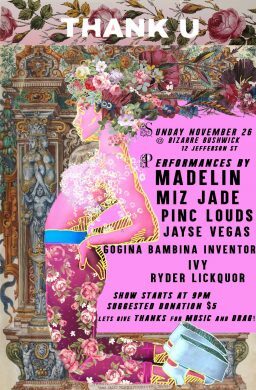 With a relatively even split of bands and drag performers, the evening features Pinc Louds, Madelin, Miz Jade, Jayse Vegas, Gogina Bambina Inventor, Ivy, and Rider Lickquor. A good game to play could be trying to guess which of those names are drag performers and which are musicians. Either way, you’ll be treated to their work come Sunday.